ADATA introduces the new XPG SX8000 PCIe 3.0 M.2 Gaming SSD featuring speeds of up to 2400 MB/s read and 1000 MB/s write. 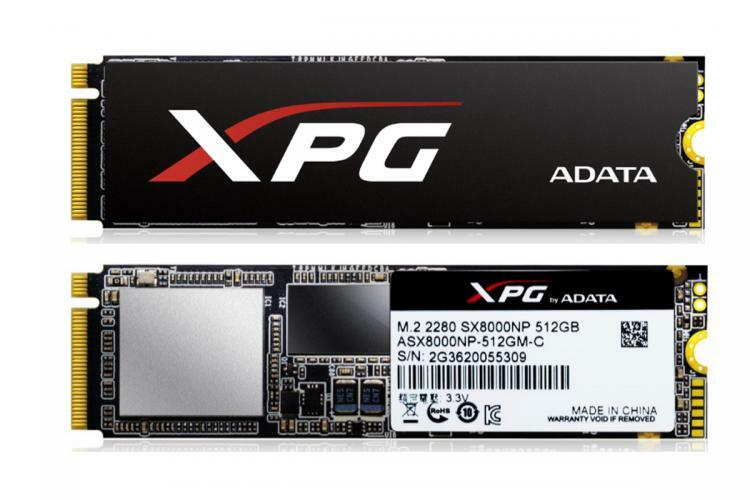 The new ADATA XPG SX8000 SSD uses 3D MLC NAND Flash chips with an SMI 2260 controller in a M.2 form factor. The ADATA XPG SX8000 also meets the NVMe 1.2 specifications which is compatible to motherboards with PCIe 3.0 3X4 which promises 2400 MB/s read and 1000 MB/s write with 100K/140K IOPS. The ADATA XPG SX8000 will come in capacities including 128GB, 256GB, 512GB and 1TB. A variant with a more attractive gaming XPG heatsink will be released as well by the end of October which promises better aesthetics for enthusiast builders. The new ADATA XPG SX8000 uses the M.2 2280 form factor through the PCIe 3.0 x4 for both desktop and laptop use. It boasts speeds of up to 2400 Mb/s reads and 1000 Mb/s writes. Random 4k IOPS are 100K/140K read and write. The ADATA XPG SX8000 meets the NVMe 1.2 requirements ensuring excellent performance while ensuring stability for different uses including rendering, overclocking and gaming. 3D NAND Flash architecture offers reliability and larger capacities to be available. This also provide higher TBW (Total Bytes Written) for all the ADATA XPG SX8000 models. ADATA firmware design ensures integrity and performance to every ADATA SSD. Intelligent SLC Caching promotes speed boosts on extreme data loads and also to increase performance via DRAM Cache Buffer. The SX8000 is a feature-packed storage solution backed with a 5-year warranty. Visit the ADATA website for more information on the XPG SX8000 SSD.